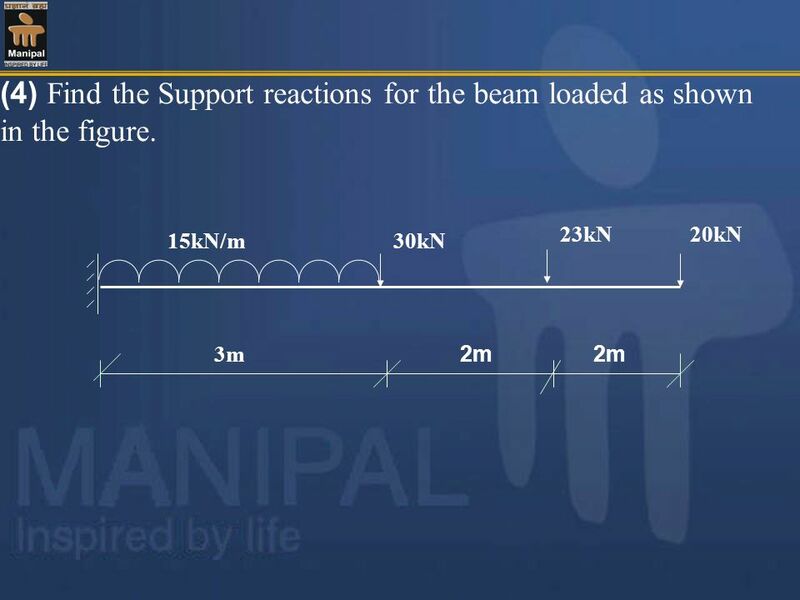 2 Supports: A structure is subjected to external forces and transfers these forces through the supports on to the foundation. 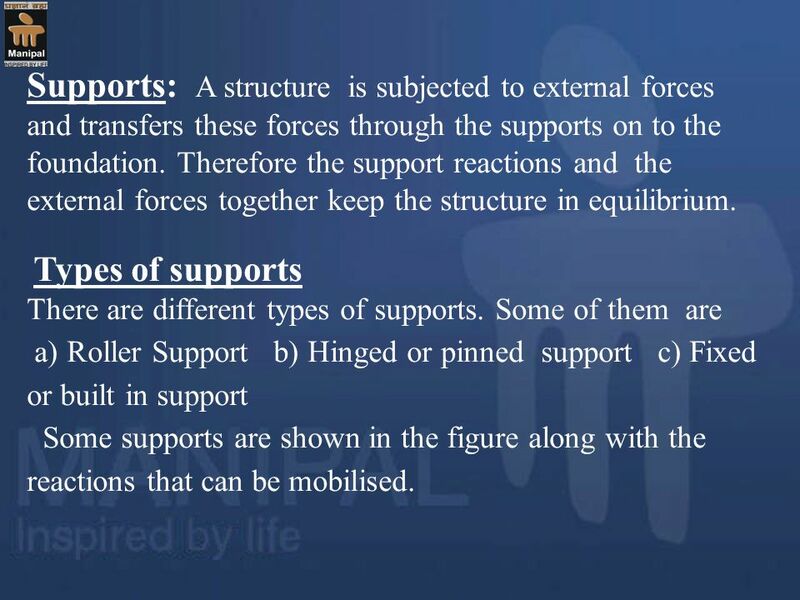 Therefore the support reactions and the external forces together keep the structure in equilibrium. Types of supports There are different types of supports. 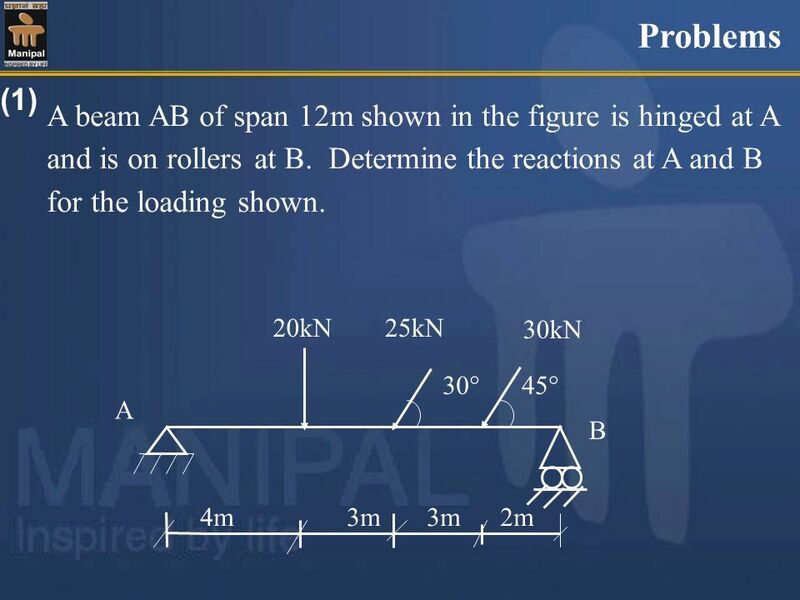 Some of them are a) Roller Support b) Hinged or pinned support c) Fixed or built in support Some supports are shown in the figure along with the reactions that can be mobilised. 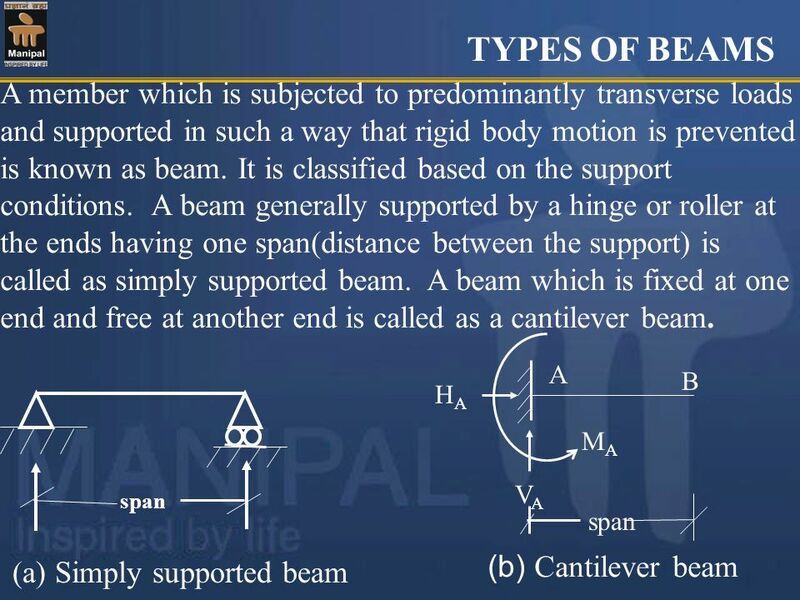 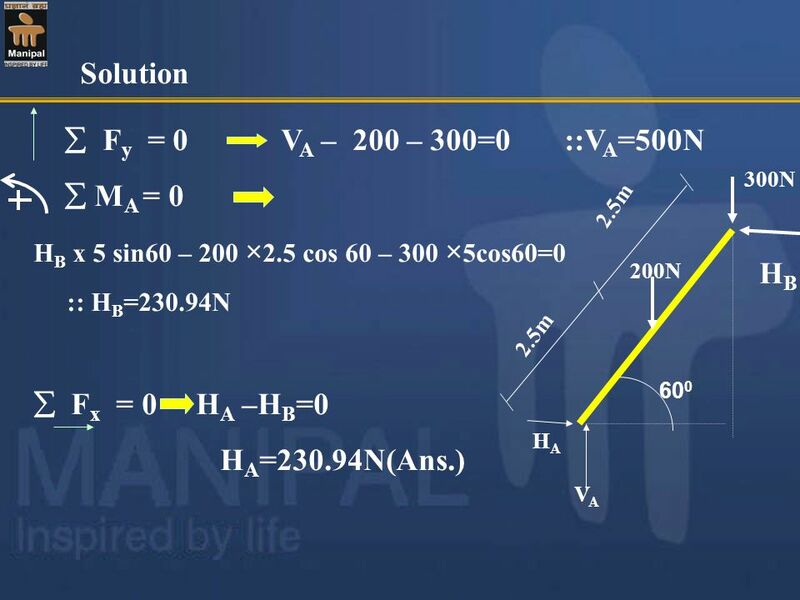 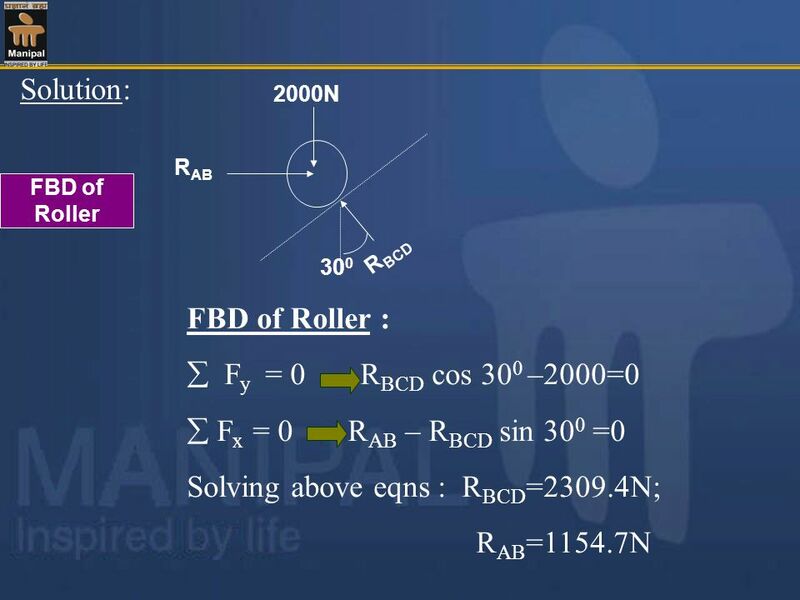 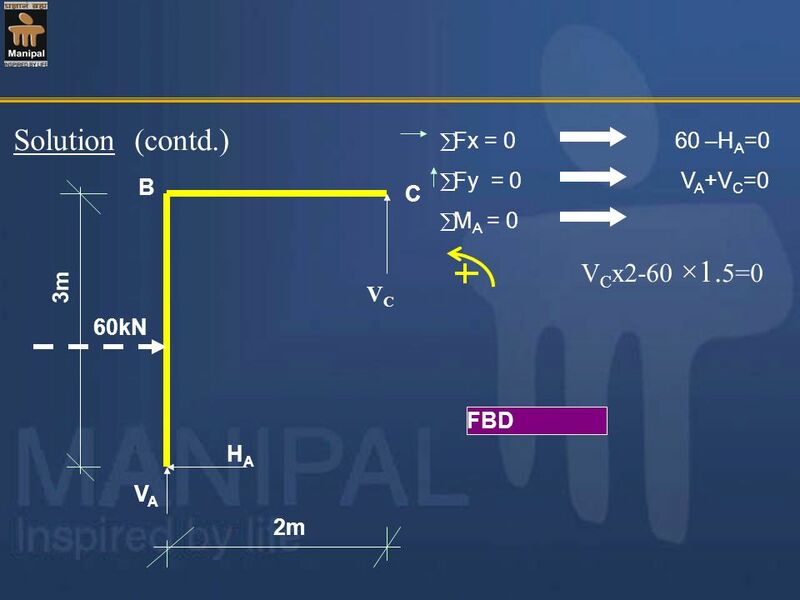 Rh θ Rv R This support does not allow any translatory movement of the rigid body. 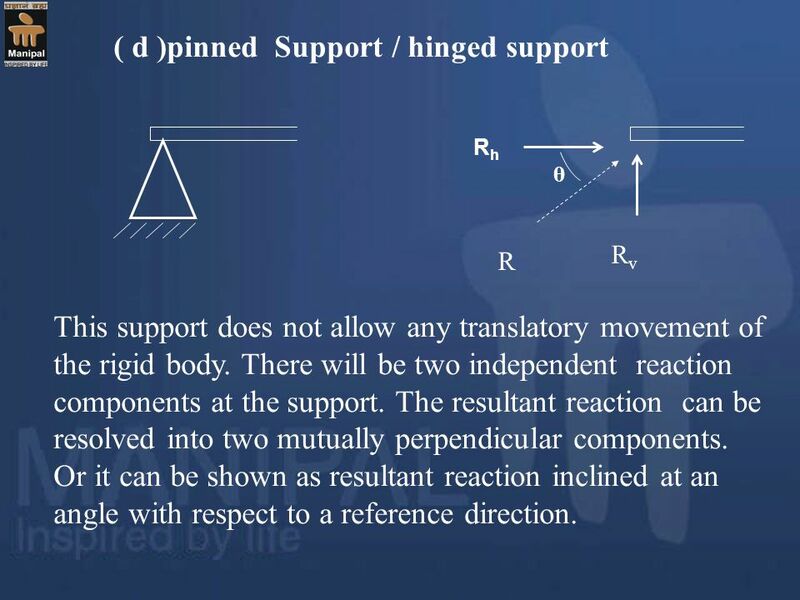 There will be two independent reaction components at the support. 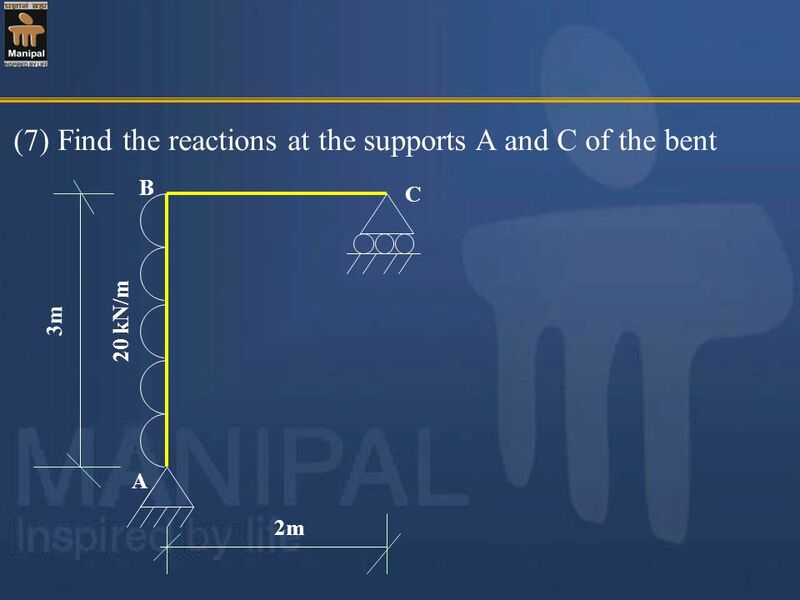 The resultant reaction can be resolved into two mutually perpendicular components. 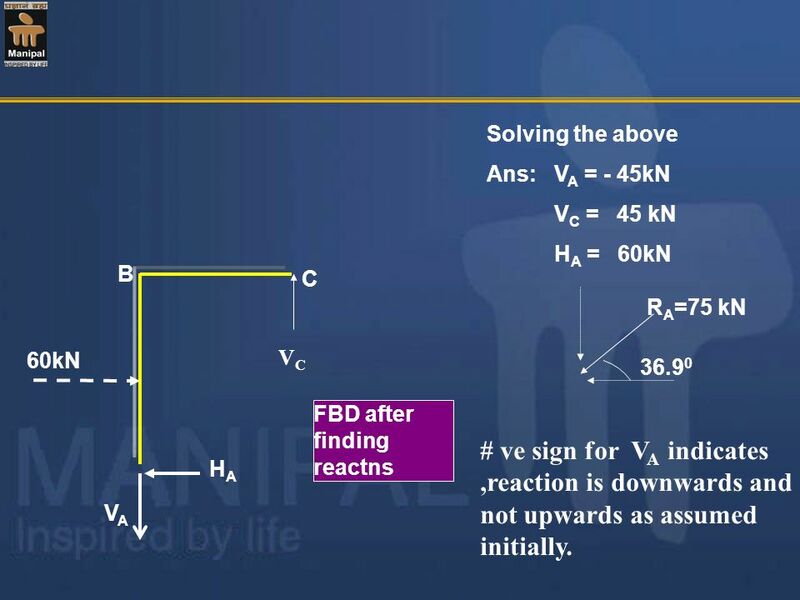 Or it can be shown as resultant reaction inclined at an angle with respect to a reference direction. 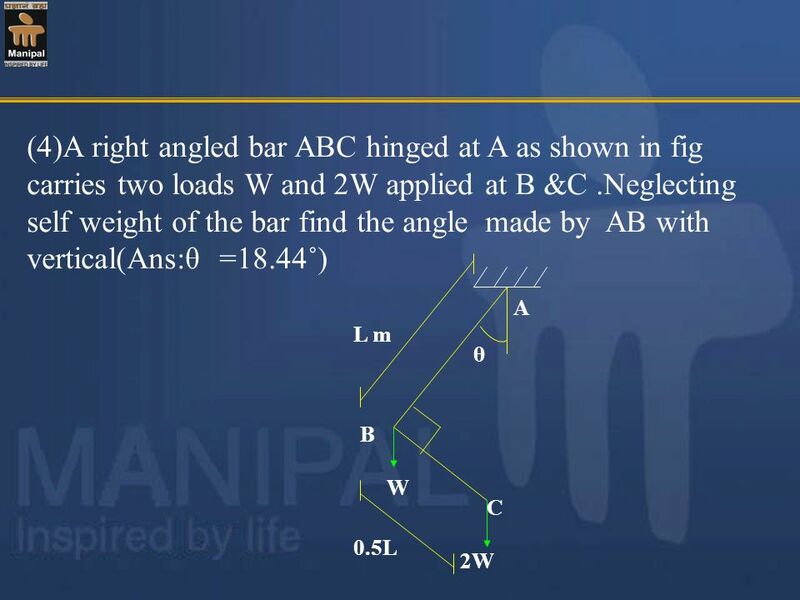 7 (contd .) 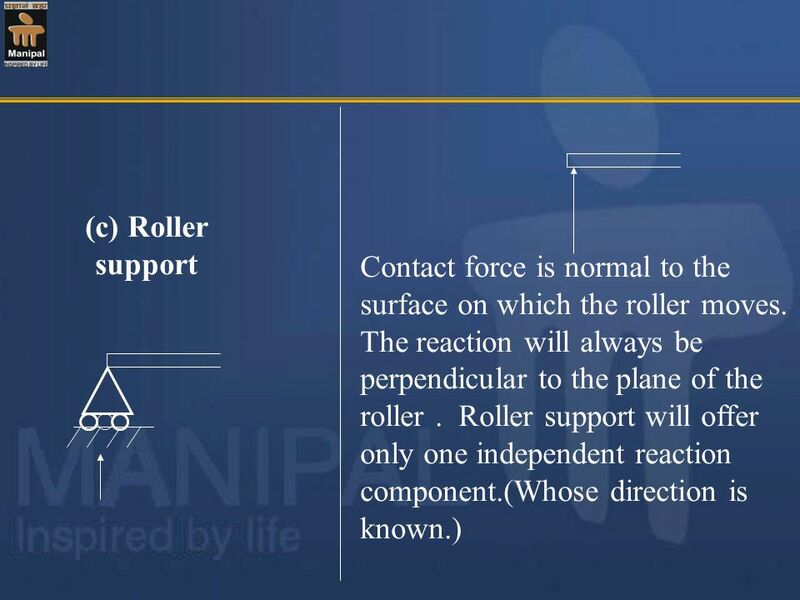 This type of support not only prevents the translatory movement of the rigid body, but also the rotation of the rigid body. 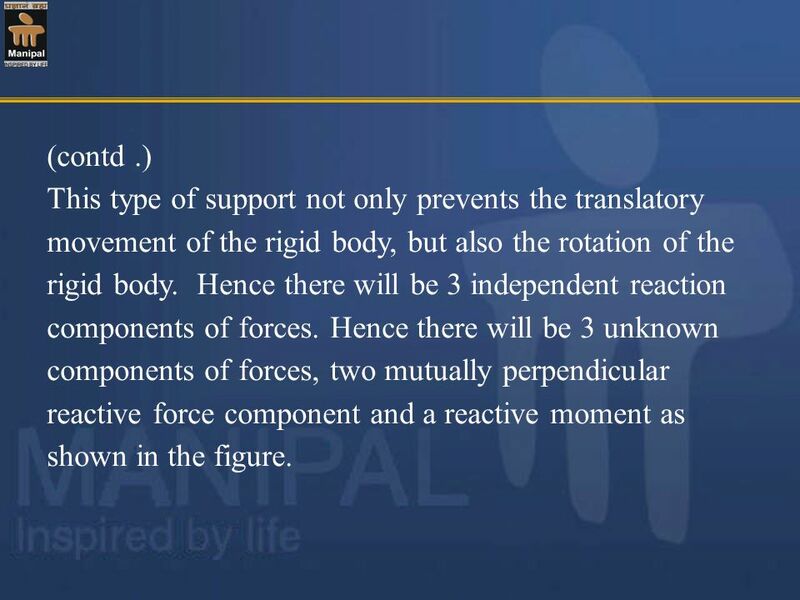 Hence there will be 3 independent reaction components of forces. 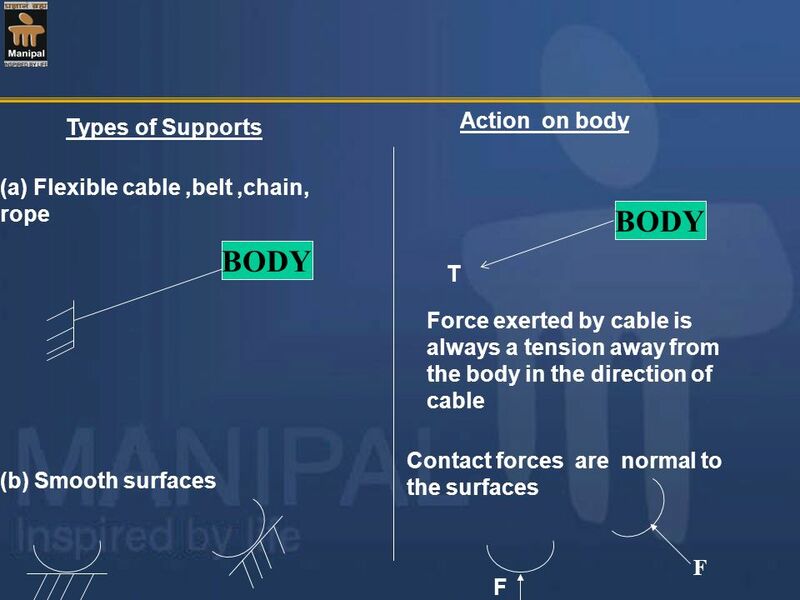 Hence there will be 3 unknown components of forces, two mutually perpendicular reactive force component and a reactive moment as shown in the figure. 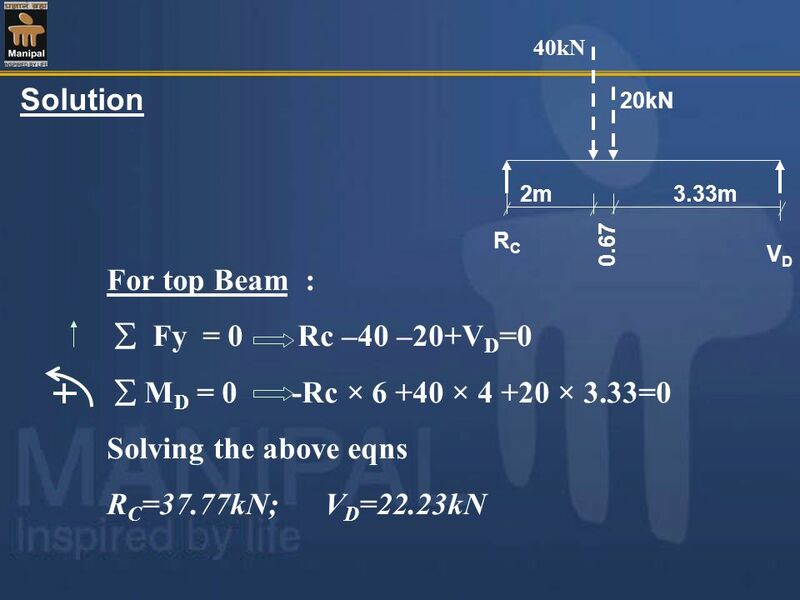 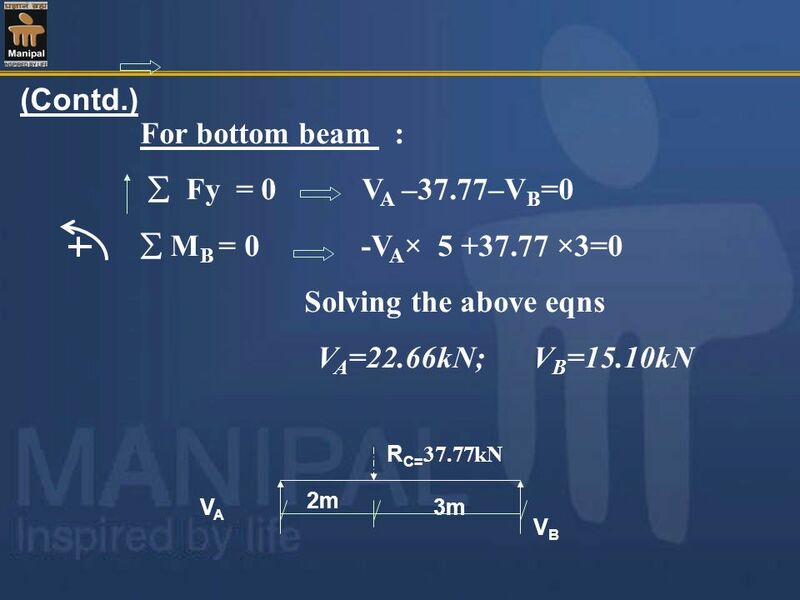 Using the equations of equilibrium given in Eq(1) ,if all the reaction components can be found out, then the beam is a statically determinate beam ,and if all the reaction components can not be found out using equations of equilibrium only, then the beam is a statically indeterminate beam. 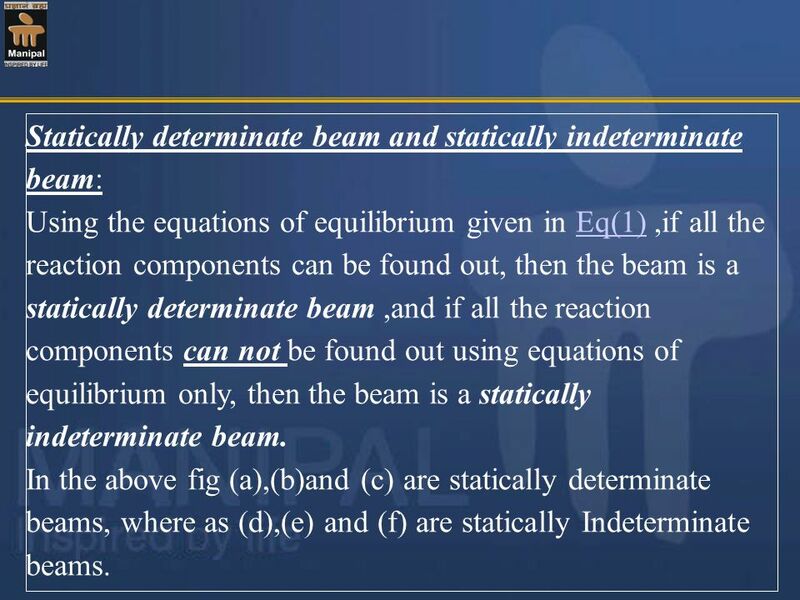 In the above fig (a),(b)and (c) are statically determinate beams, where as (d),(e) and (f) are statically Indeterminate beams. 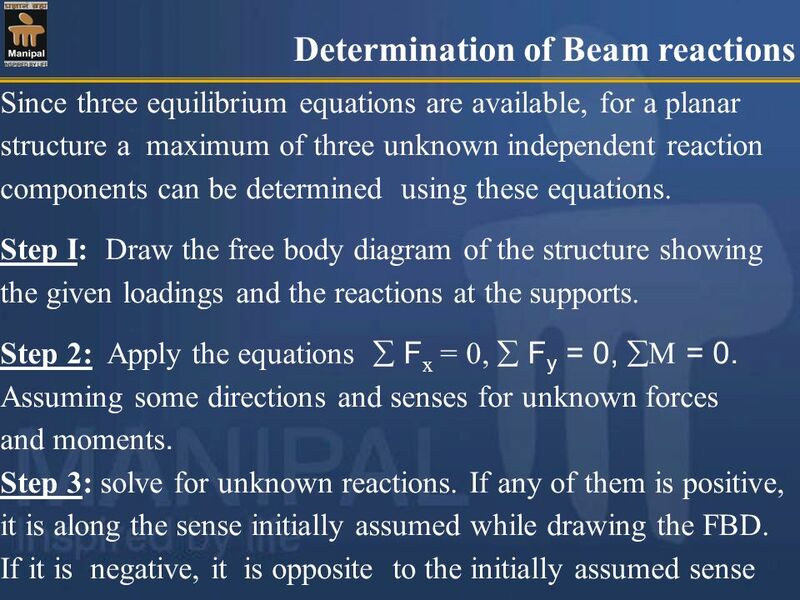 12 If the number of reaction components is more than the number of non-trivial equilibrium equations available then such a beam is a statically indeterminate beam. 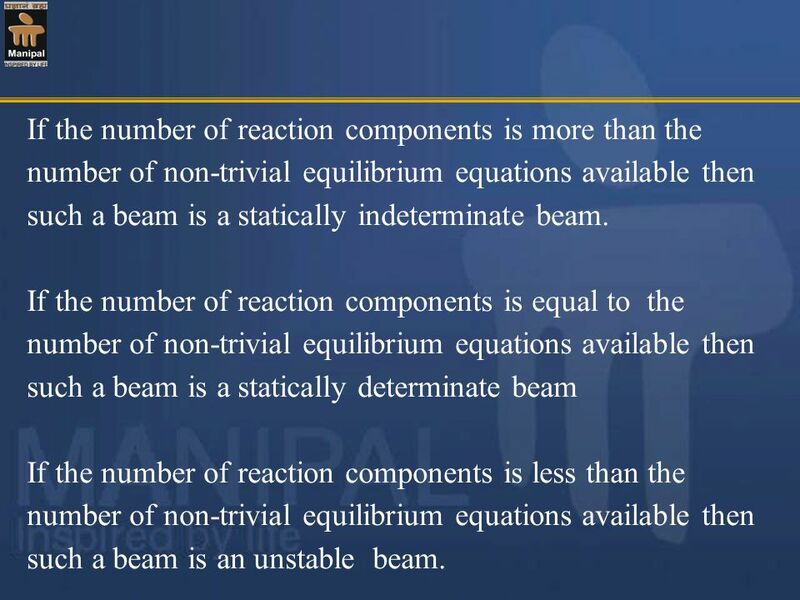 If the number of reaction components is equal to the number of non-trivial equilibrium equations available then such a beam is a statically determinate beam If the number of reaction components is less than the number of non-trivial equilibrium equations available then such a beam is an unstable beam. 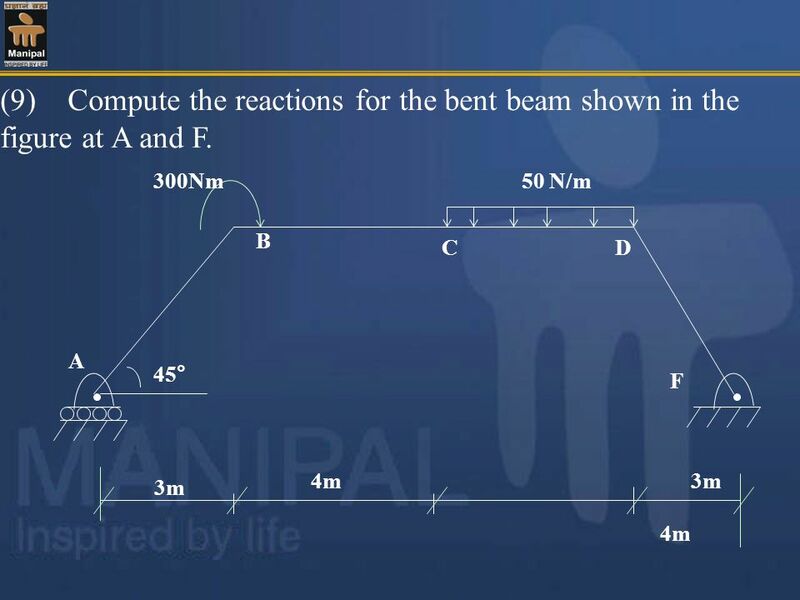 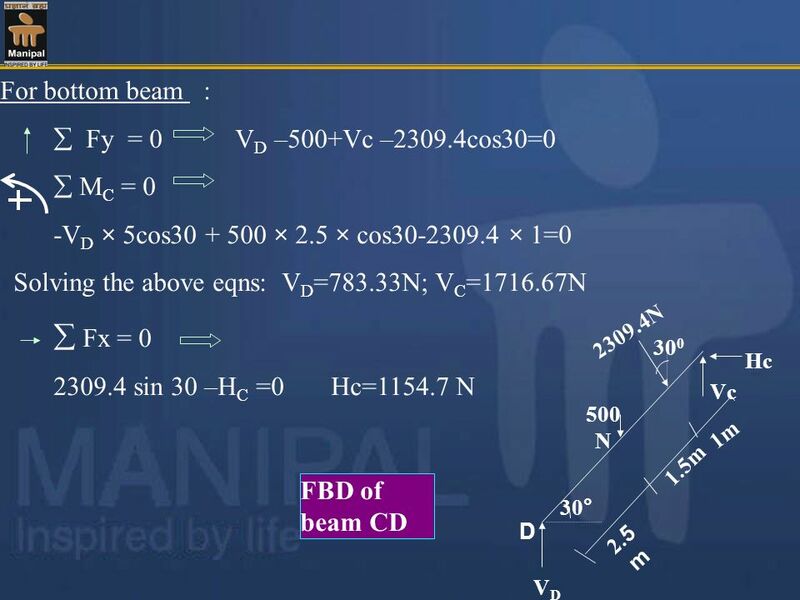 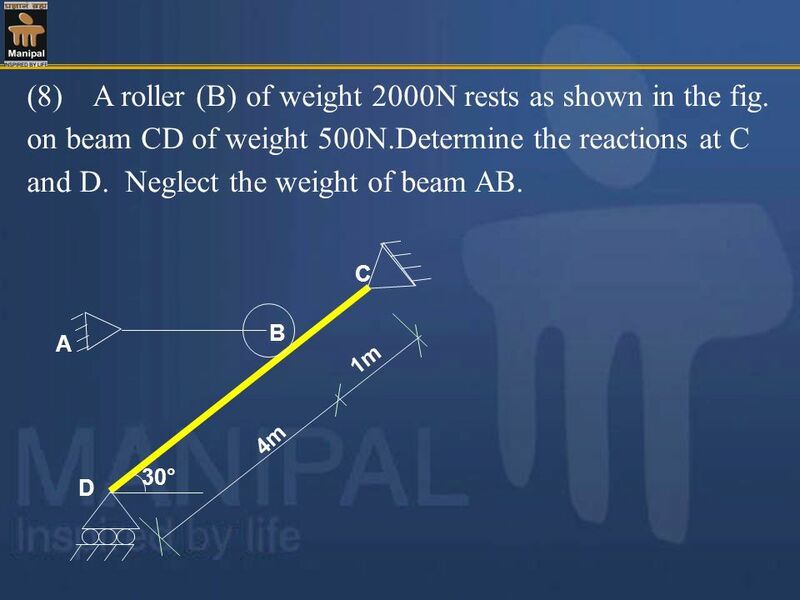 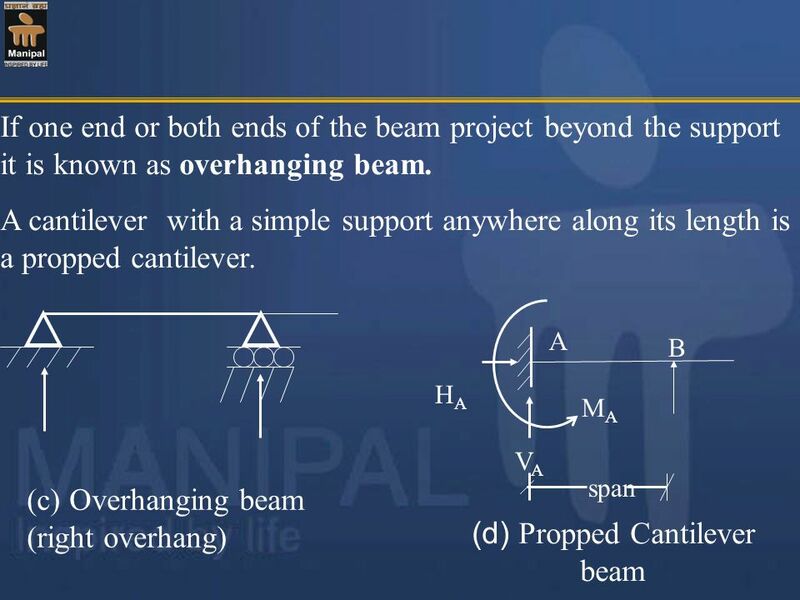 17 (2) Find the Support reactions for the given beam loaded as shown in the figure. 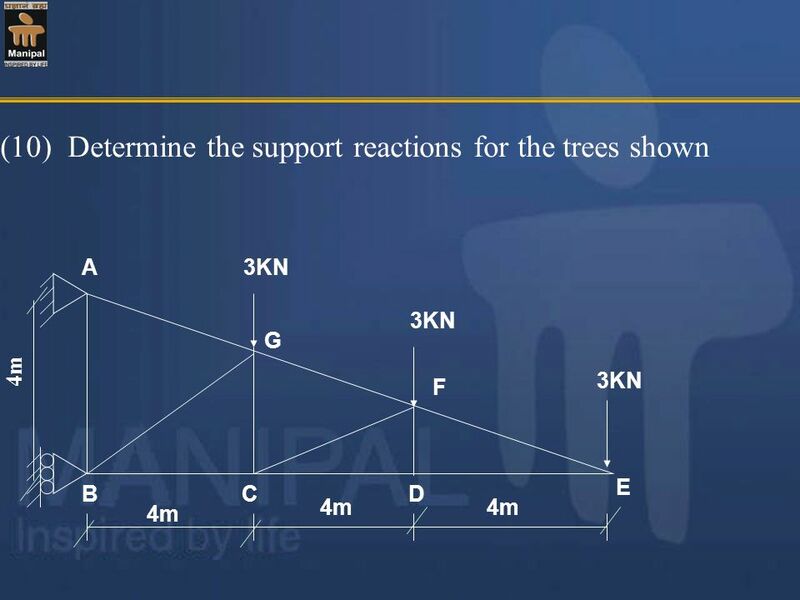 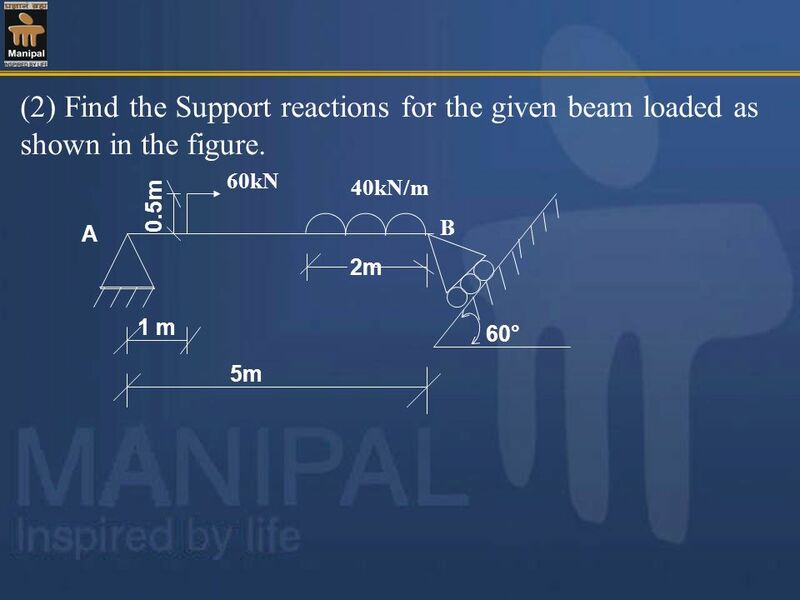 19 (3) Find the Support reactions for the given beam loaded as shown in the figure. 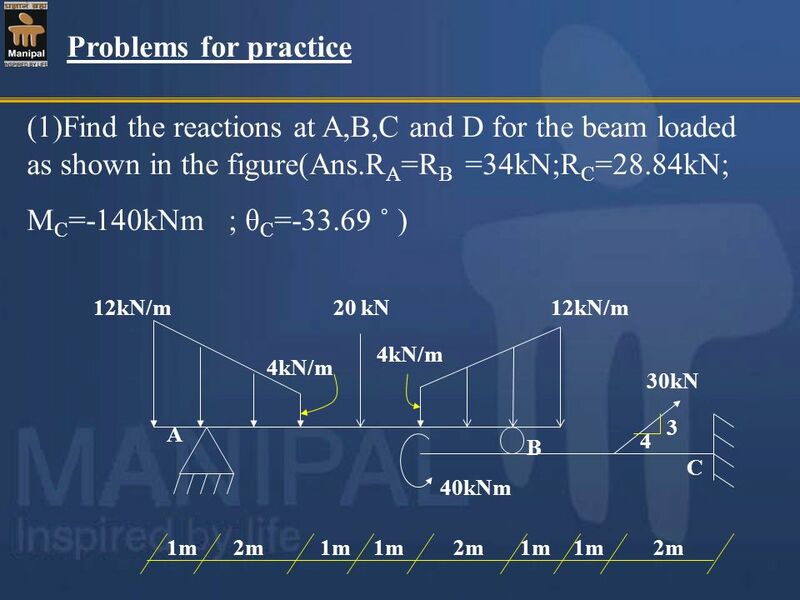 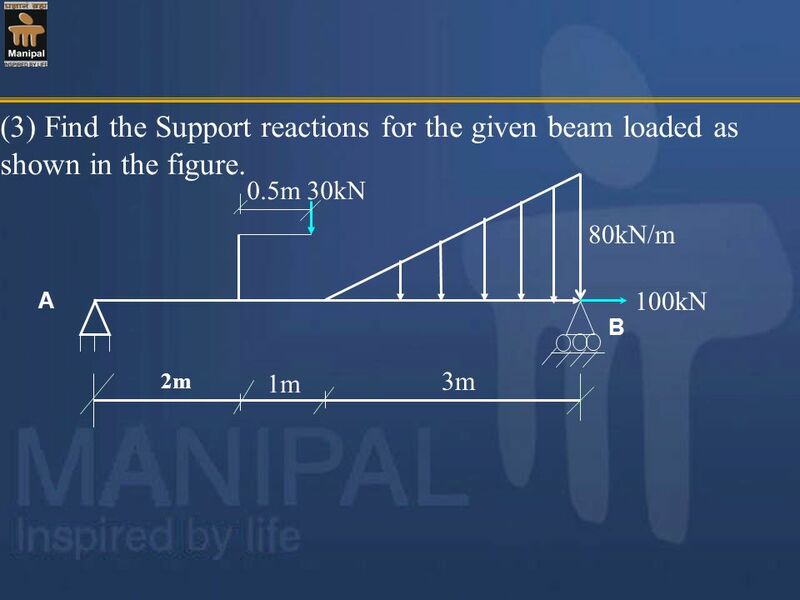 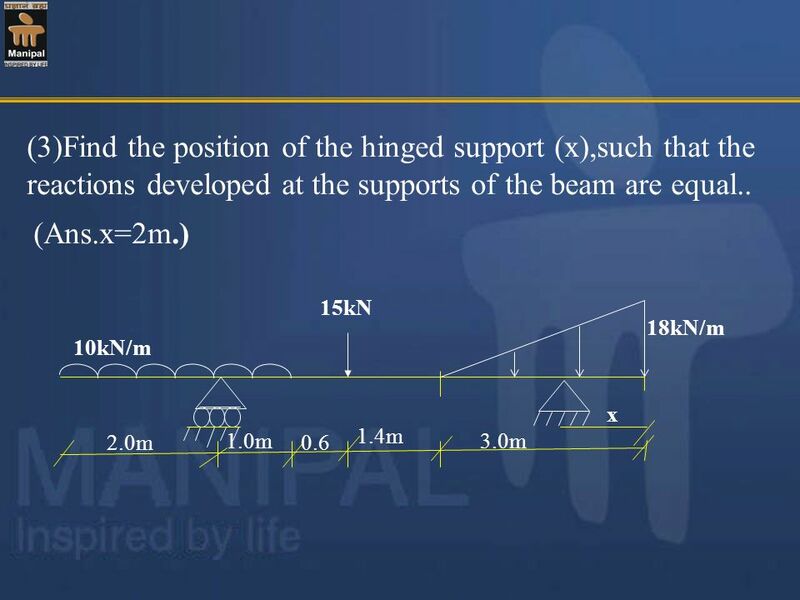 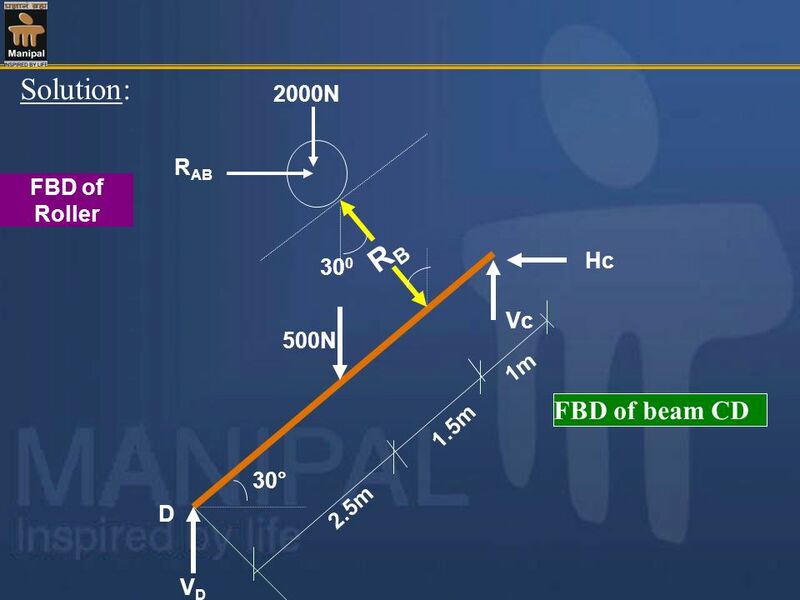 22 (4) Find the Support reactions for the beam loaded as shown in the figure. 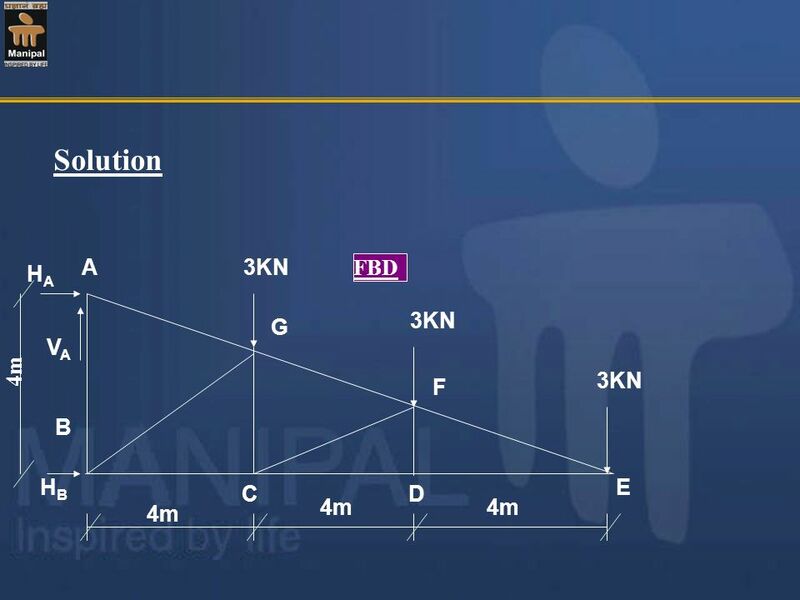 (6) A ladder of length 5m has a weight of 200N. 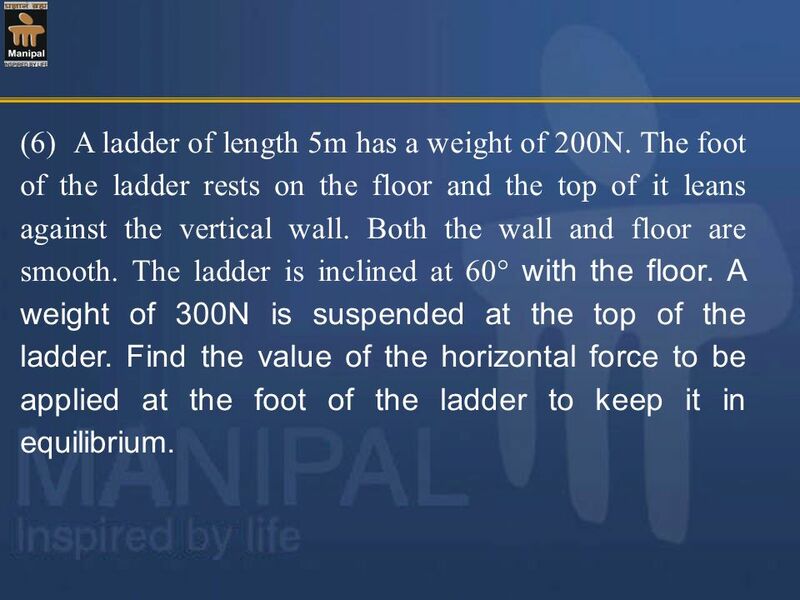 The foot of the ladder rests on the floor and the top of it leans against the vertical wall. 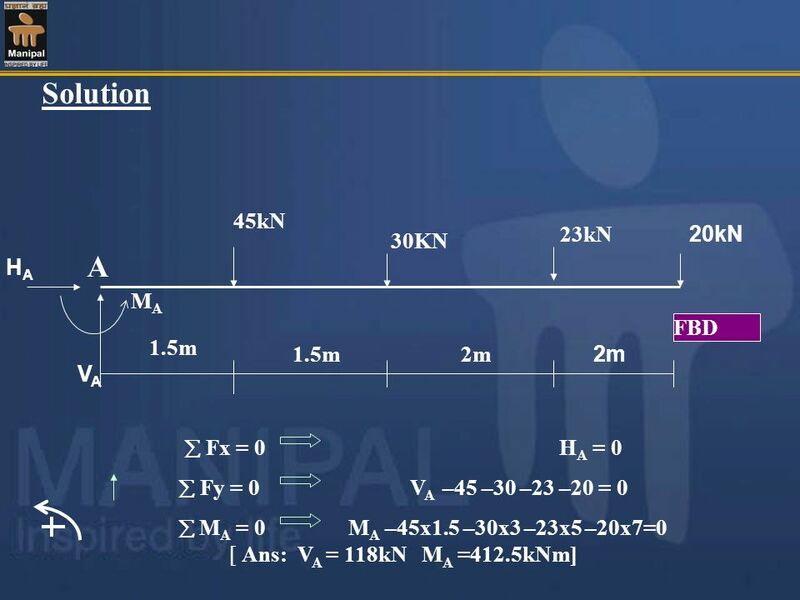 Both the wall and floor are smooth. 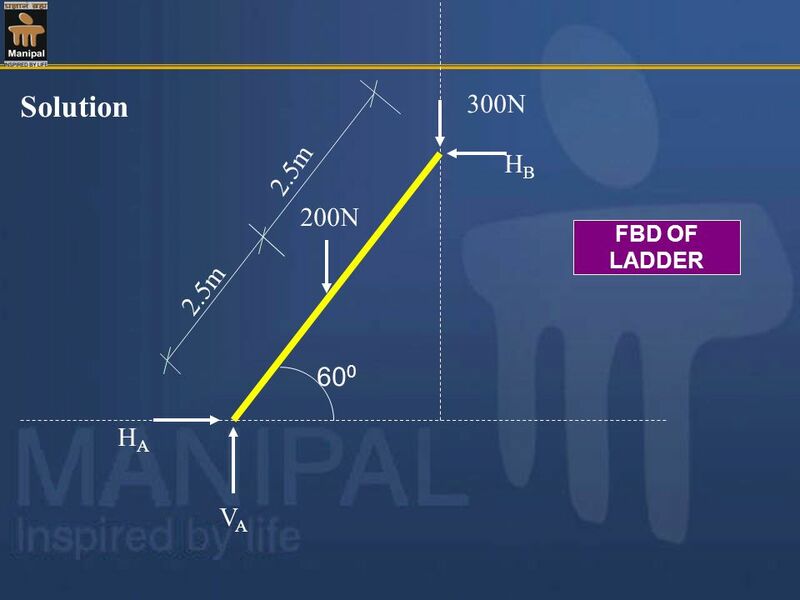 The ladder is inclined at 60 with the floor. 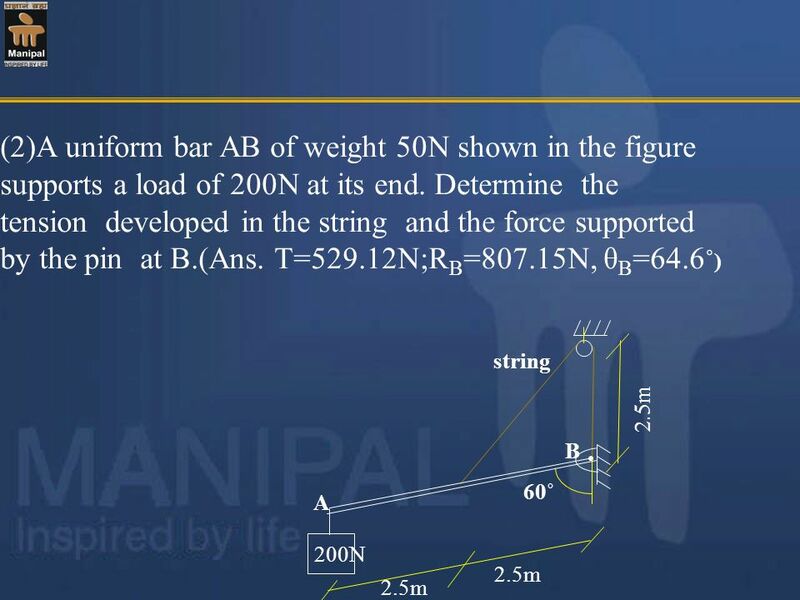 A weight of 300N is suspended at the top of the ladder. 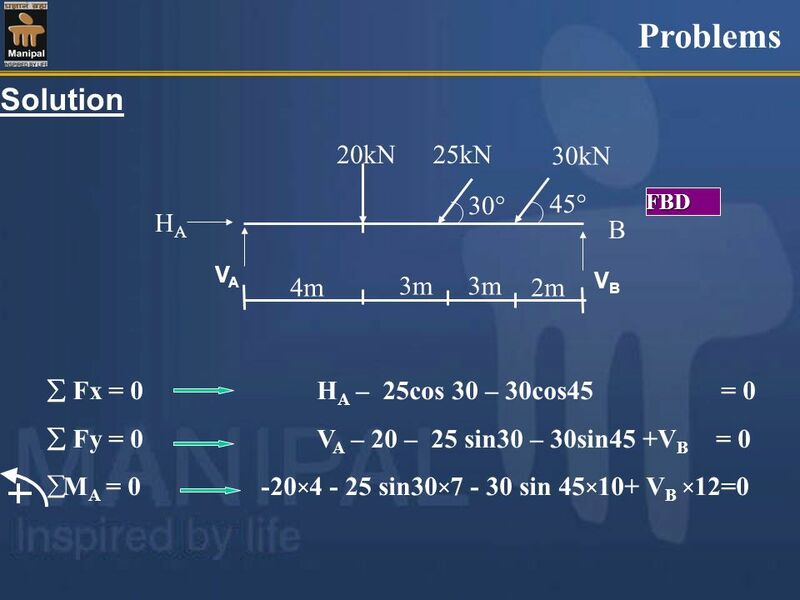 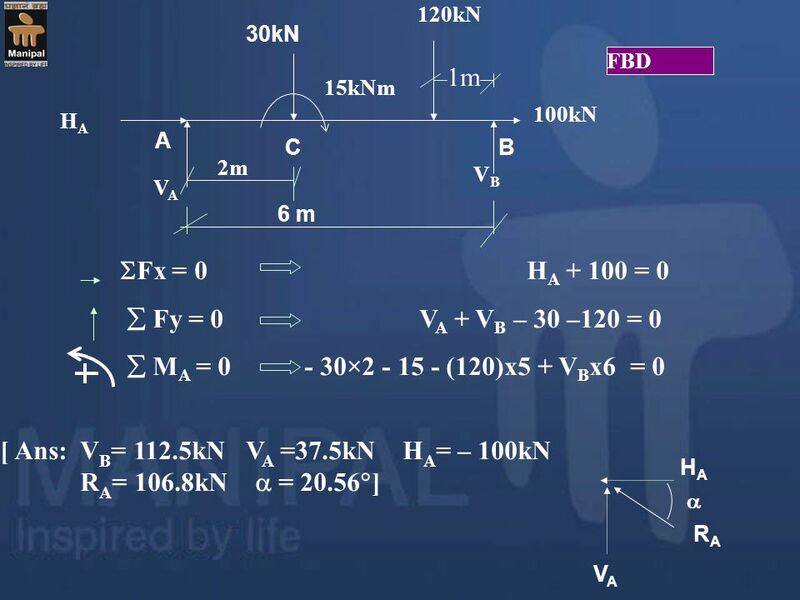 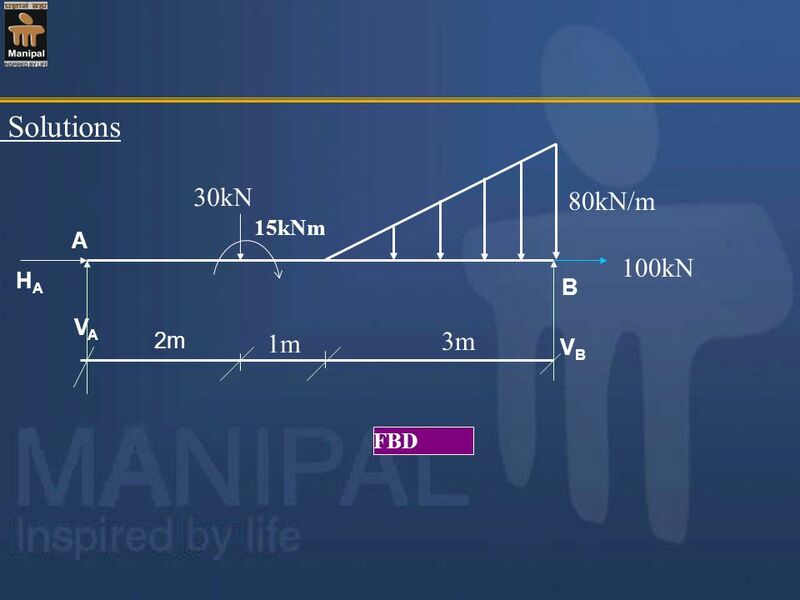 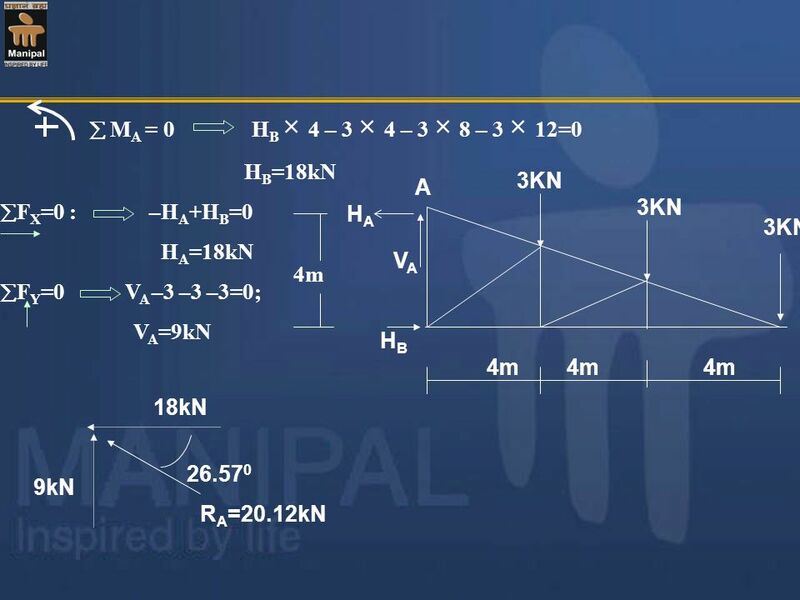 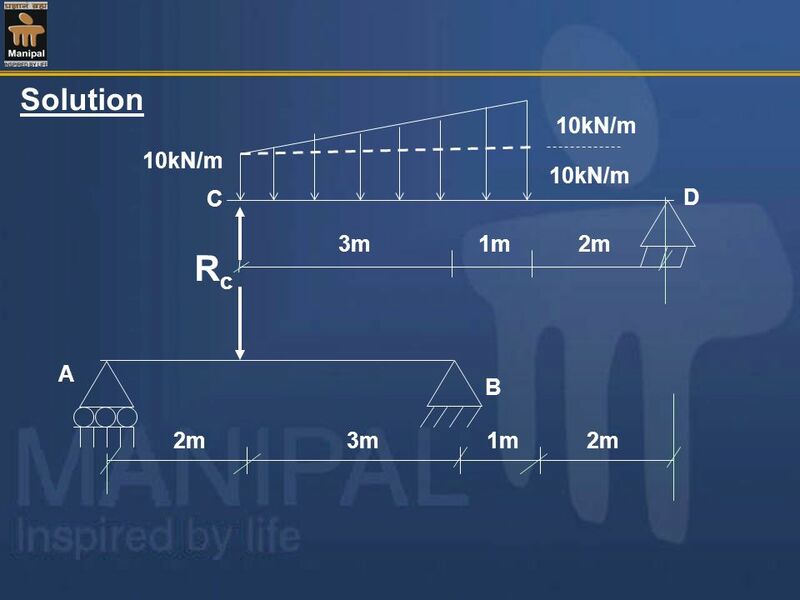 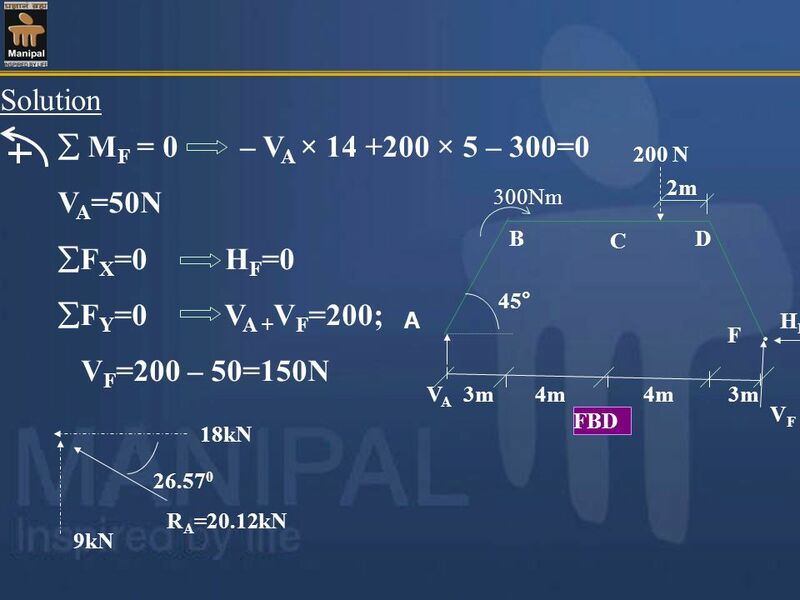 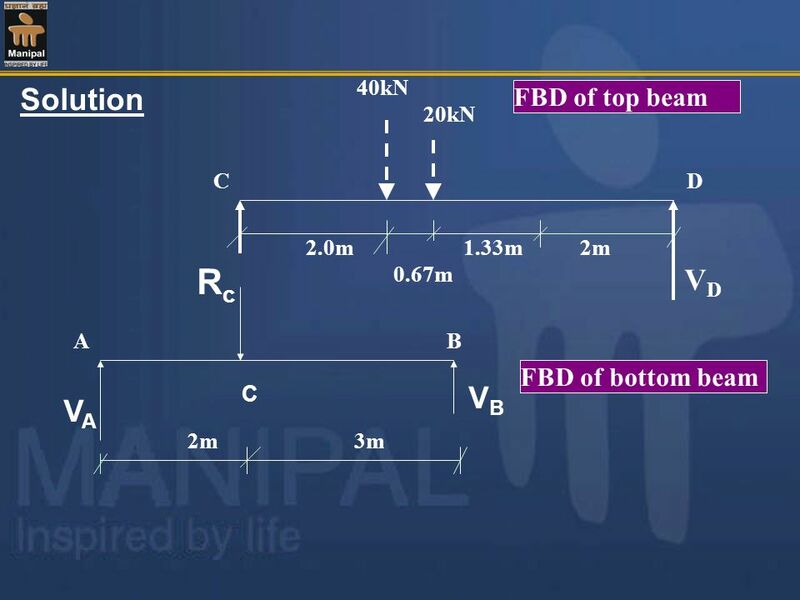 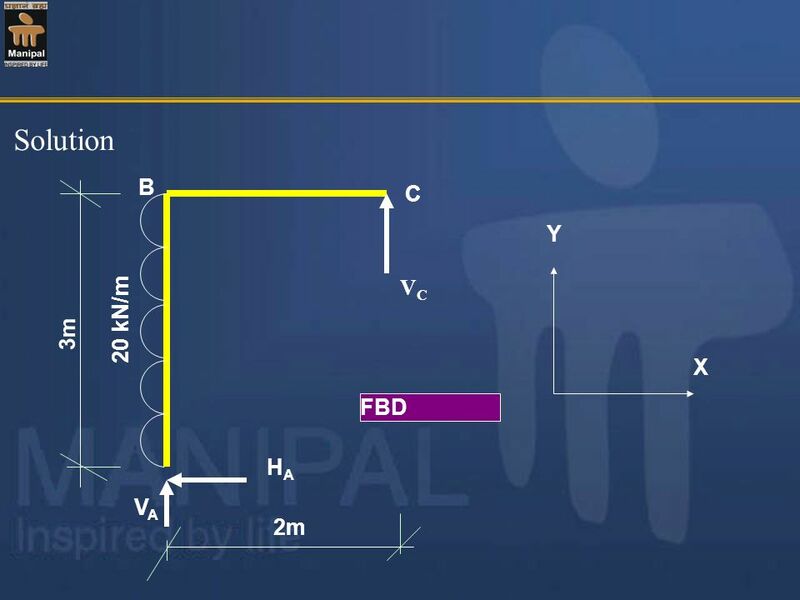 Find the value of the horizontal force to be applied at the foot of the ladder to keep it in equilibrium. 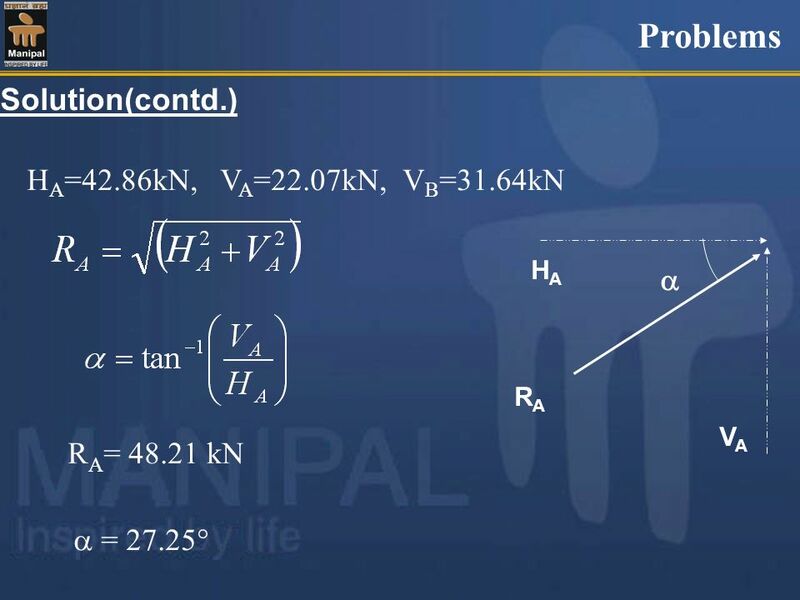 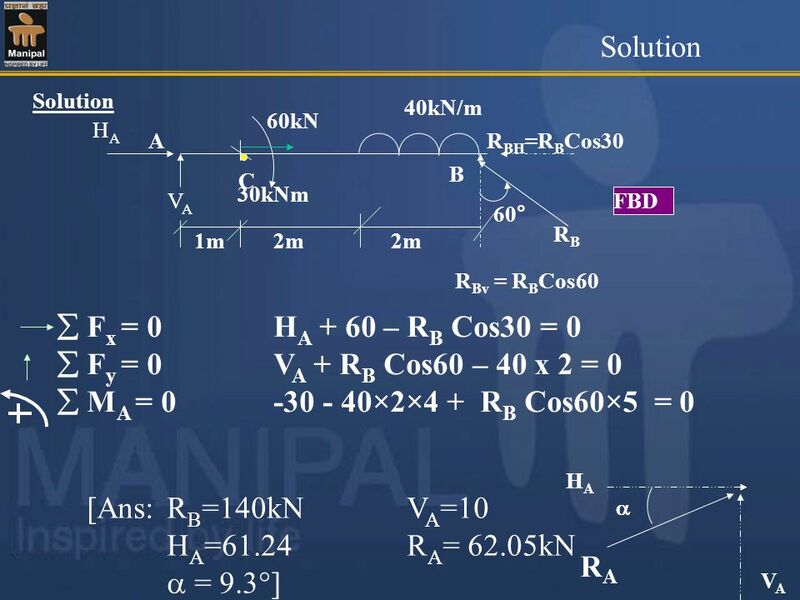 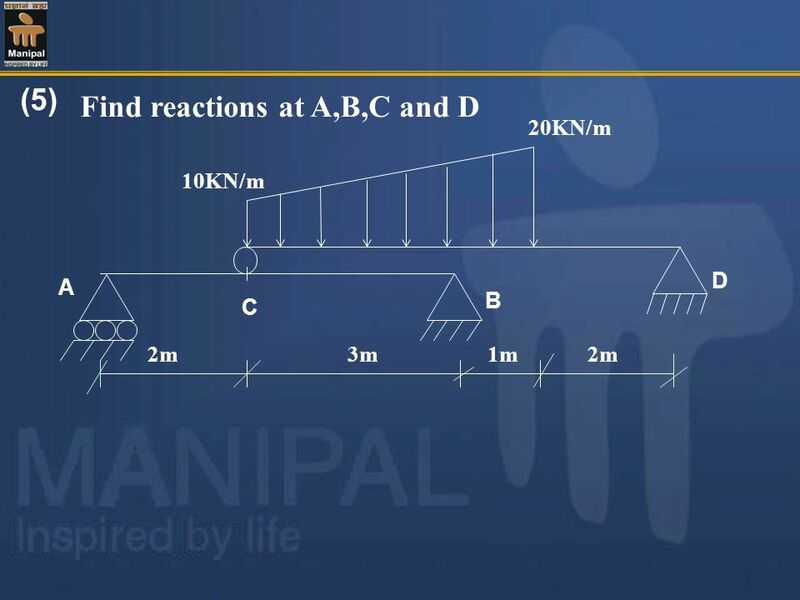 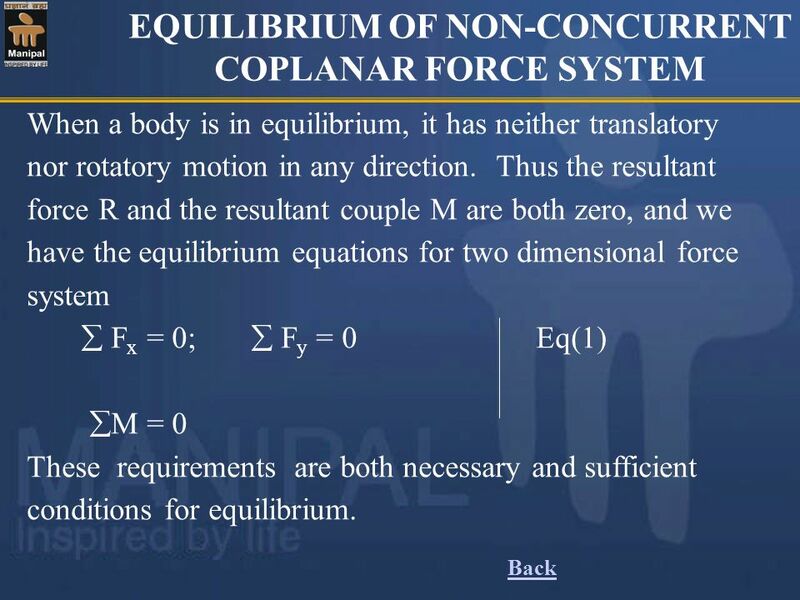 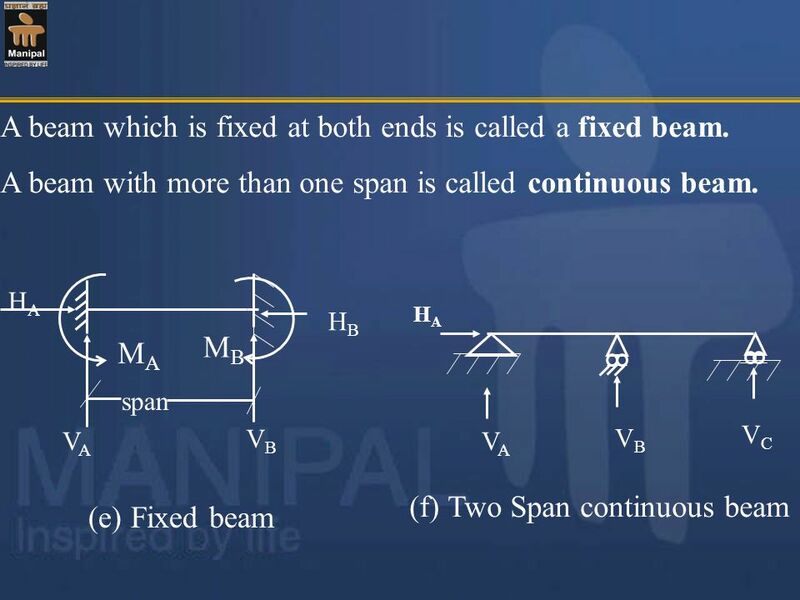 40 (9) Compute the reactions for the bent beam shown in the figure at A and F.
Download ppt "EQUILIBRIUM OF NON-CONCURRENT COPLANAR FORCE SYSTEM"